Mumbai, Oct 25 (IANS) Healthy buying in state-run banks stocks lifted the key Indian equity indices — S&P BSE Sensex and NSE Nifty 50 — to breach their respective intra-day and closing record highs on Wednesday. According to market observers, the exponential rise in scrip prices of state-run banks was witnessed a day after the government had announced a massive scheme to recapitalise the sector and to boost the overall infrastructure spend. 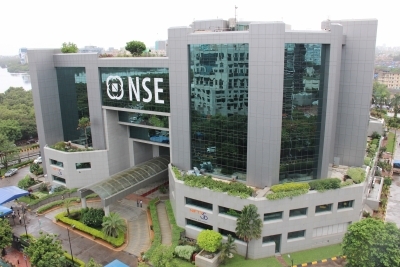 On intra-day record high basis, the barometer 30-scrip Sensitive Index (Sensex) of the BSE touched 33,117.33 points, while broader 50-scrip Nifty at the National Stock Exchange (NSE) reached 10,340.55 points. Besides new intra-day highs, the S&P BSE Sensex which opened at 32,995.28 points, closed at a new high of 33,042.50 points, up 435.16 points or 1.33 per cent from its previous day’s close at 32,607.34 points. The index had slipped to a low of 32,804.60 points during the trade session. Similarly, the NSE Nifty 50 closed at a new high of 10,295.35 points, up 0.86 per cent or 87.65 points. “Markets zoomed higher on Wednesday to close at new life highs. The index had opened on a strong note in the morning session on the back of positive sentiments due to various measures taken by the government to spur economy including capitalisation of public sector banks and a massive road building programme,” Deepak Jasani, Head – Retail Research, HDFC Securities, told IANS. Even global cues supported the Indian indices as major Asian and European markets ended on a positive note, barring the Nikkei index. However, the day’s trade session belonged to the PSBs. “SBI was the top percentage gainer in the NSE Nifty, surging as much as 27 per cent to its highest since January 2015. L&T was the third-largest gainer in the index as it rose as much as 6.3 per cent,” Desai said. Market observers pointed out that almost all the major PSBs like SBI, PNB and BoB rose in the band of 20-40 per cent. The S&P BSE bank — BANKEX — zoomed by 1,274.17 points or 4.71 per cent. On bank-specific basis, SBI’s scrip gained Rs 70.20 or 27.58 per cent to Rs 324.70 per equity share. Other gainers include — PNB whose shares rose by Rs 63.80 or 46.20 per cent to Rs 201.90; BoB’s stocks edged higher by Rs 45.05 or 31.47 per cent to Rs 188.20; Bank of India’s scrip was up Rs 47.70 or per cent 33.96 per cent to Rs 188.15 and Canara Bank’s stock was up Rs 120.70 or 38.05 per cent to Rs 437.90. A healthy inflow of foreign funds and a strengthening of the rupee’s position against the US dollar kept the market trajectory northwards throughout the session. In terms of investments, provisional data with the exchanges showed that foreign institutional investors (FIIs) bought scrip worth Rs 3,582.50 crore, whereas domestic institutional investors (DIIs) sold stocks worth Rs 155.71 crore. On the currency front, the rupee strengthened by 16 paise to close at 64.89-90 against the US dollar from its previous close at 65.06. Sector-wise, the S&P BSE capital goods index surged by 581.28 points, followed by the automobile index higher by 156.80 points and the oil and gas index augmented by 76.56 points. On the other hand, the S&P BSE consumer durables index plunged by 239.38 points and the healthcare index receded by 154.64 points. Major Sensex gainers on Wednesday were: ICICI Bank, up 14.69 per cent at Rs 305.60; Axis Bank, up 4.61 per cent at Rs 472.70; Bharti Airtel, up 2.76 per cent at Rs 515.50; Adani Ports, up 2.18 per cent at Rs 414.95; and Tata Motors DVR, up 1.62 per cent at Rs 234.65. Major Sensex losers were: Kotak Mahindra Bank, down 5.43 per cent at Rs 1,009.70; HDFC Bank, down 3.76 per cent at Rs 1,794.50; HDFC, down 2.60 per cent at Rs 1,677.90; Lupin, down 2.22 per cent at Rs 1,003.75; and Sun Pharma, down 2.10 per cent at Rs 523.25.